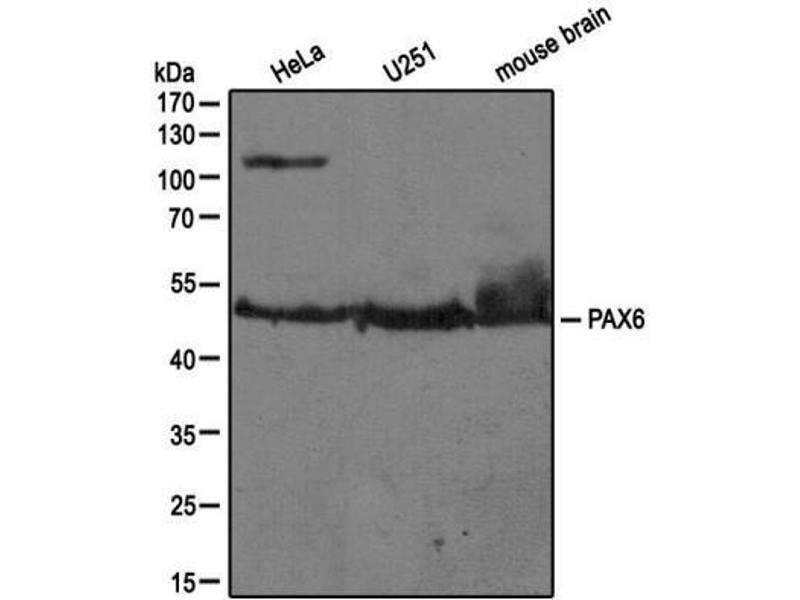 Western Blot: Pax6 Antibody [ABIN268519] - Analysis of extracts from HeLa, U251 and mouse brain using PAX6 antibody (ABIN268519, 1:100). 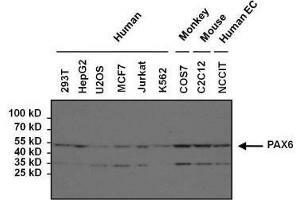 Western Blot: Pax6 Antibody [ABIN268519] - Analysis of various human, mouse and non-human primate whole cell lysates. 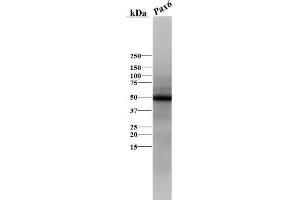 Western Blot: Pax6 Antibody [ABIN268519] - Analysis of Pax6 in skate (Leucoraja erinacea) brain lysate using anti-Pax6 antibody. Image from verified customer review. 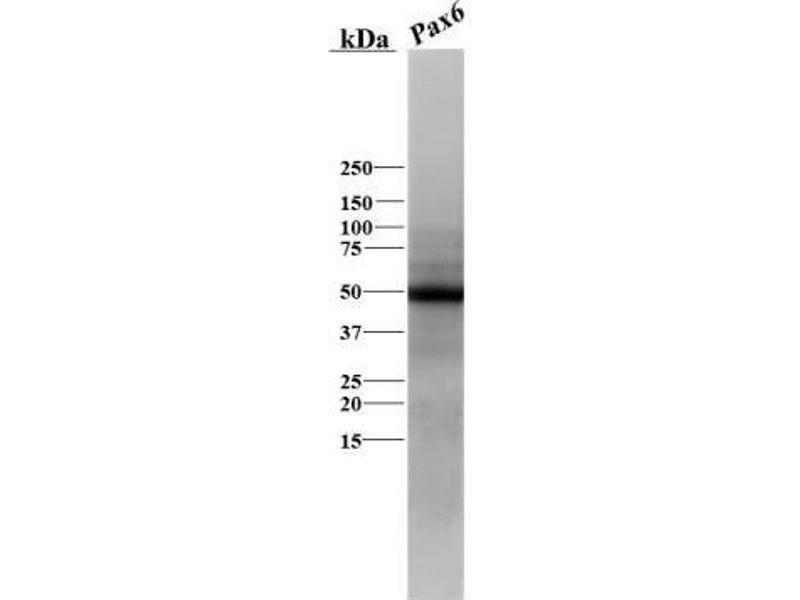 Immunocytochemistry/Immunofluorescence: Pax6 Antibody [ABIN268519] - Formalin fixed cells were permeabilized with 0.1% Triton X-100 in TBS for 10 minutes at room temperature and blocked with 1% Blocker BSA for 15 minutes at room temperature. 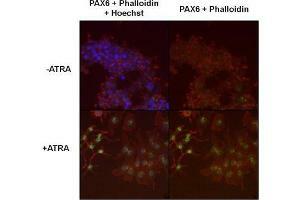 Cells were probed with a PAX6 polyclonal antibody at a dilution of 1:400 for 30 minutes at room temperature. 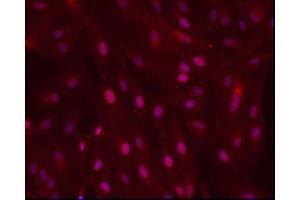 F-Actin (red) was stained with DyLight 554 Phalloidin were stained with Hoechst 33342 dye. 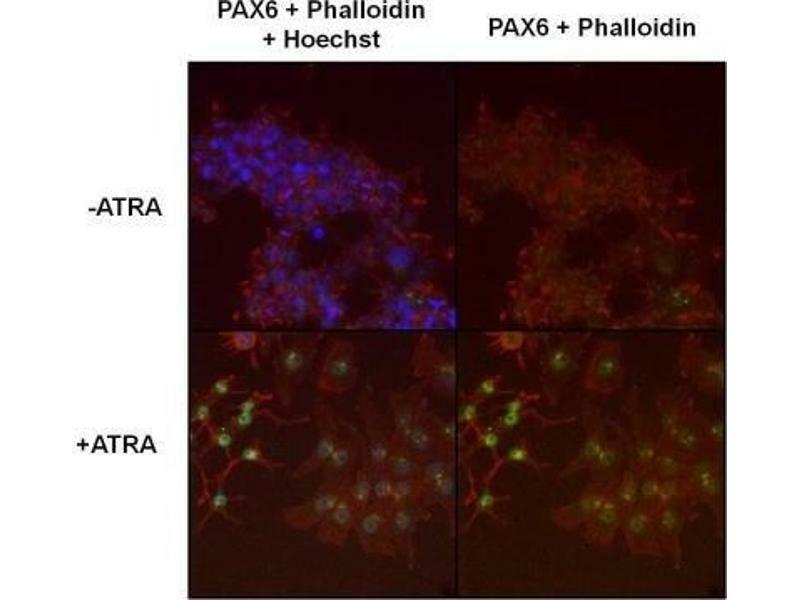 Specificity Detects a ~47 kDa protein representing PAX6 (Schwann Cell Marker) from rat whole eye extracts and ovine retinal extracts. 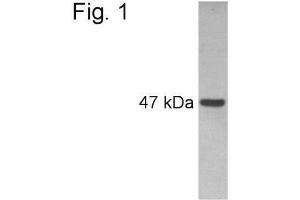 Immunogen Synthetic peptide corresponding to residues C R(267) E E K L R N Q R R Q A S N T P S H I(285) of mouse PAX6. 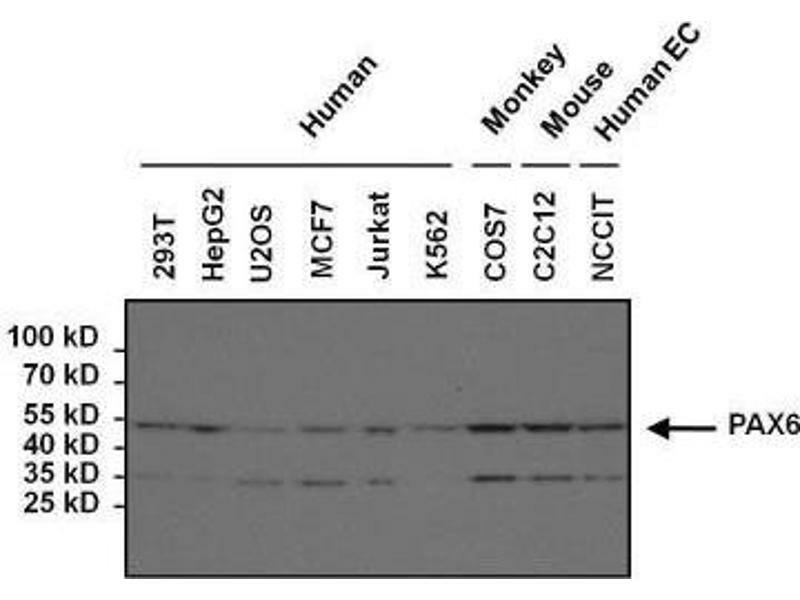 Application Notes Western Blot 1:1000, Immunocytochemistry/Immunofluorescence 1:50, Immunoprecipitation 5 μgThe observed molecular weight of the protein may vary from the listed predicted molecular weight due to post translational modifications, post translation cleavages, relative charges, and other experimental factors. 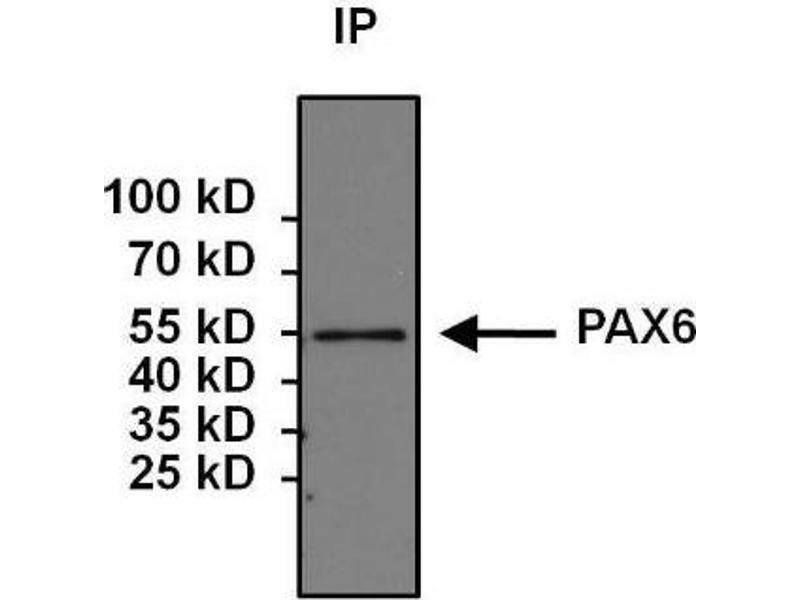 Immunoprecipitation: Pax6 Antibody [ABIN268519] - Analysis of PAX6 was performed on 293T cells. 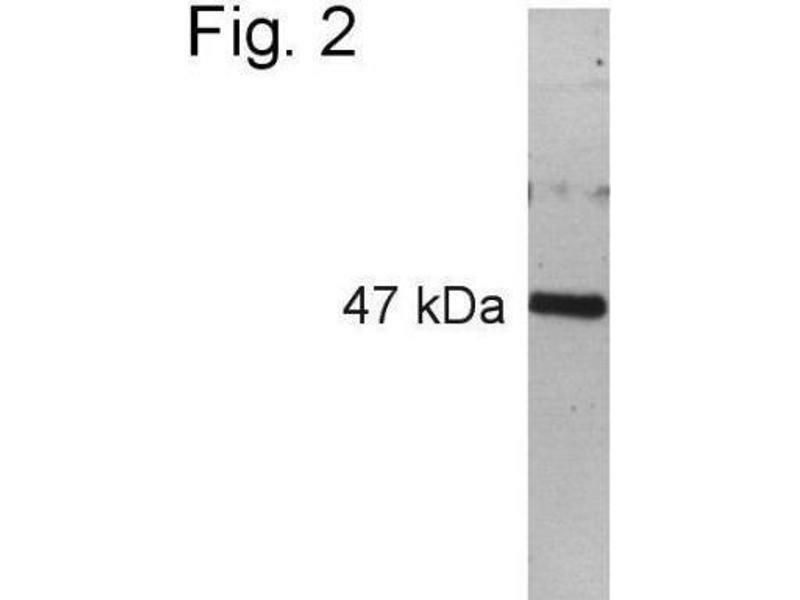 Antigen: antibody complexes were formed by incubating 500ug whole cell lysate with 5ug of PAX6 polyclonal antibody overnight on a rocking platform at 4C. 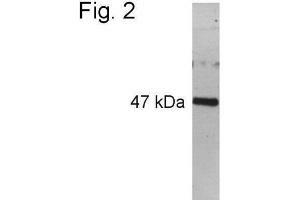 The immune complexes were captured on 50ul Protein A/G Plus Agarose, washed extensively, and eluted with 5X Lane Marker Reducing Sample Buffer. 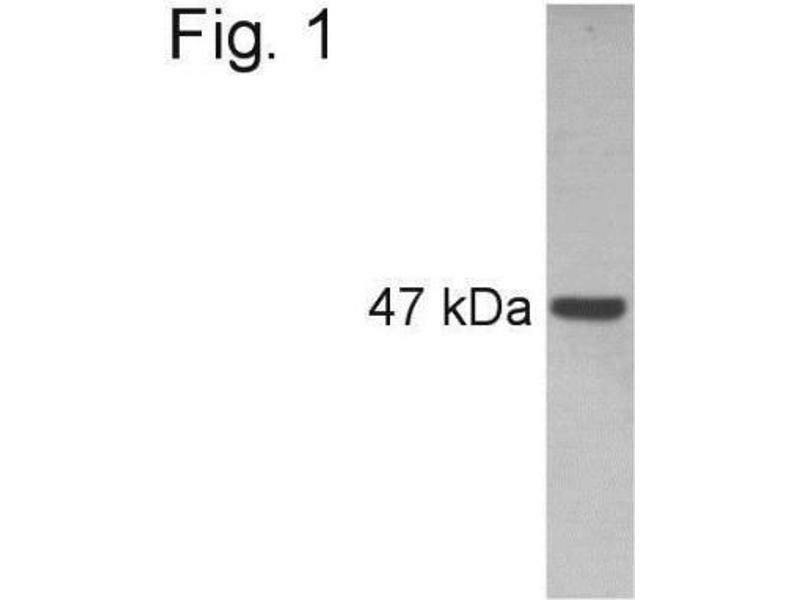 Samples were resolved on a 4-20% Tris-HCl polyacrylamide gel, transferred to a PVDF membrane, and blocked with 5% BSA/TBS-0.1%Tween for at least 1 hour. 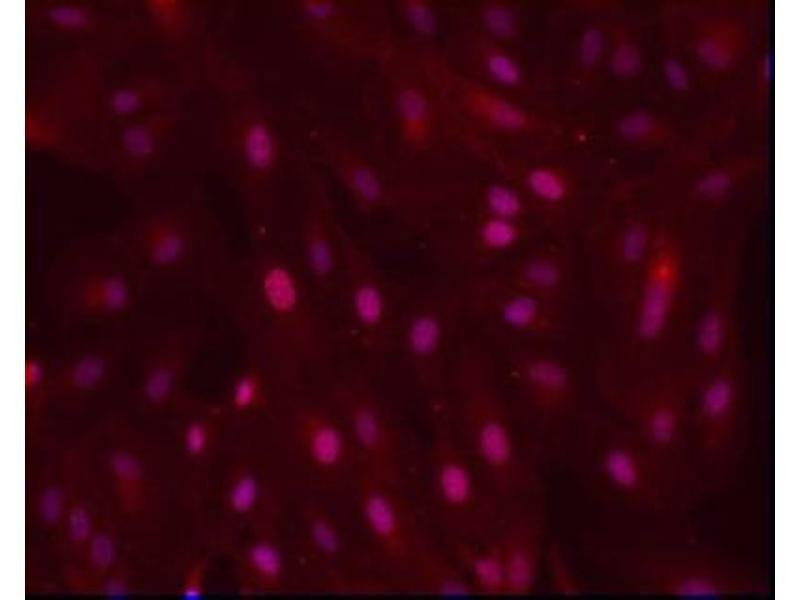 The membrane was probed with a PAX6 monoclonal antibody at a dilution of 1:1000 overnight rotating at 4C, washed in TBST, and probed with Clean-Blot IP Detection Reagent at a dilution of 1:1000 for at least one hour. 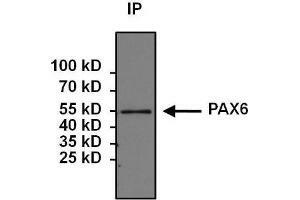 Immunocytochemistry: Pax6 Antibody - ARPE-19 monolayer on glass substrate. Fixative Methanol Blocking Goat Serum. Dilution 1:100. Incubation 1h @ RT. This image was submitted via customer Review.